…where unique historical and natural wonders flow together. Sure, winter is still here and it’s cold outside. But for those of you who have visions of lush green turf grass dancing in your heads, rest assured that a beautiful well-kept lawn is just a few months away. It’s important to know what type of turf grass you have prior to applying any products. The most common grasses for our area are Bermuda, zoysia, centipede and St. Augustine. These are called warm season grasses because they go dormant in cold weather. Experts recommend applying a pre-emergent product to your lawn once per year. If you missed this chore in the fall, mid to late February is an ideal time to eliminate weeds before they have a chance to establish. This preemptive strike could reduce the need for herbicides later in the growing season. One temptation is also to fertilize the lawn before it is “awake”. Fertilizing your lawn before it is green and ready to uptake nutrients will only provide an ideal situation for weeds to grow, waste your money, and possibly provide an opportunity for rain to wash the fertilizer into local waterways. Always wait until the temperatures are warm enough so that there is no chance of frost, and your turf grass is completely green before applying the right fertilizer for your soil’s needs. For best results, FIRST do a soil test to determine exactly what nutrients are missing. You can pick up a FREE soil test kit from the Jefferson County Stormwater Program Office, B-210 Courthouse, or at your local Alabama Extension Office. The cost to mail and receive an analysis from Auburn University is $7 per sample. Then, choose the right product for the job and ALWAYS follow label directions. AL People Against a Littered State (PALS) Spring Cleanup – Want to make a difference in your community? Consider organizing or participating in a volunteer roadside litter cleanup. Last year, 1076 volunteers participated in 35 cleanups, removing 57 tons of litter and trash from roadways in unincorporated Jefferson County. Several of these volunteers received statewide awards for their efforts. Cleanup resources such as flyers, gloves, bags, safety t-shirts, traffic control and trash disposal are available for FREE to unincorporated Jefferson County Communities. Call 325-8741 to learn how your community can participate! Tree Seedling Giveaway – February 22 – Celebrate Arbor Day and stop by Linn Park from 8 am – 2 pm to select FREE tree seedlings ready for planting. For more information, call 787-5222 or 781-0598. 25th Annual Plant Dig – February 25 – Grab your shovels, wheeled carts, and come on out to the New Georgia Landfill between 8 am and 1 pm to select and bring home some FREE native plants, just in time for your spring gardening plans! Call 787-5222 or 781-0598 to learn more. JeffCO H20:It’s Just a Drop! You notice a drop of oil on the driveway under your car. Not a big deal, right? Probably not a good reason to spend the time and money to take the car into the service shop. But then there is another drop tomorrow, and another the next day. At the end of the week, it still doesn’t seem to be anything to worry about, just seven drops. That is, until you factor in the other 600,000 vehicles registered in Jefferson County. If just 10% of these cars drip one drop of oil per day, that winds up being more than 3 quarts of oil dripping on the ground every day, or more than 5 gallons by the end of the week. That 5 gallons of oil can pollute 5 MILLION gallons of water if it is washed by rain into a creek or stream. To put that into perspective, an Olympic sized pool contains just 660,000 gallons of water. So yes, one drop does matter. 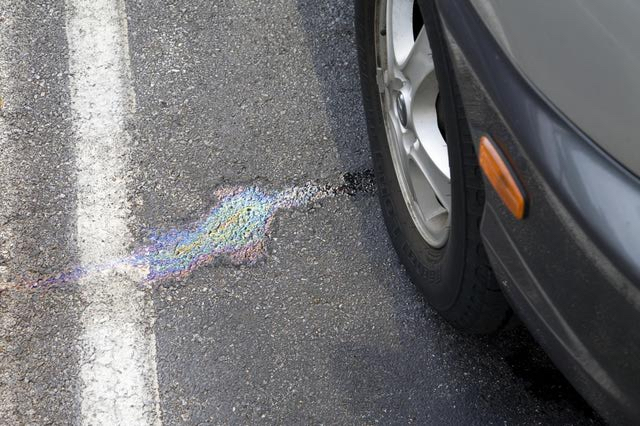 A first line of defense is to place a catch pan or oil absorbent pad under the car until you can get the leak fixed. If oil or other fluid is on the driveway, use a dry material such as cat litter or oil absorbent granules which can be purchased at most big box and auto care centers to clean it up. The dry material can be sprinkled on the spill, allowed to soak up the oil or fluid, swept up, and put into the trash. Never hose down the driveway, since that can easily wash pollutants into a storm drain, ditch or gutter which in turn empties directly into a local creek or stream! There are literally tens of thousands of beauty products on the market that claim to make your skin feel and look smoother. One type of product is skin cleanser that contains an exfoliant. The premise behind these products is that they gently remove dry surface skin cells to reveal smoother skin. 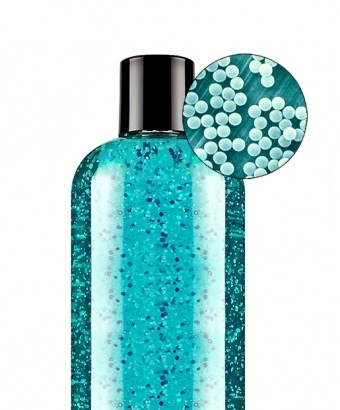 Many of these products contain plastic microbeads to do the job of exfoliation. But microbeads aren’t just prevalent in the beauty industry. Some toothpastes contain microbeads to polish and whiten your teeth as you brush. So what’s the big deal if these products work? While the microbeads may do just what they are supposed to do, they can create some dire consequences once they go down your sink or shower drain. Plastic microbeads do not disintegrate and the municipal wastewater treatment process can’t filter them from wastewater. Instead, the microbeads remain intact, making their way to local creeks, rivers, lakes, and oceans. Fish and other aquatic animals swallow the microbeads, which means that microbeads could wind up in your food supply. In December 2015, the Microbead-Free Waters Act of 2015 became law, banning the manufacture of rinse off cosmetics, which includes toothpastes that contain intentionally added plastic microbeads, effective July 1, 2017. The other good news is that there are many cleansing products available that contain exfoliants made from biodegradable ingredients such as fruit pits, nut shells, sugar, or salt. You can even make your own with similar common ingredients. As for toothpaste, read the label and choose one that does not contain microbeads, or consider alternatives such as toothpaste containing sustainable polishing agents like baking soda. ‘Tis the Season to Recycle – Between decorating, gifting, and feasting, the holiday season generates more waste than any other time of year. This can offer a great opportunity to intentionally look for ways to recycle or reuse rather than discard items that you no longer need or want. Check out aeconline.org for information about what and where to recycle many items. Consider donating gently used items such as furniture, clothing, and housewares to a local charity for someone else to enjoy rather than just discarding them. Cease the Grease – Jefferson County’s free household cooking oil and grease recycling program offers clean plastic jugs and recycling kiosks conveniently placed at 21 locations. 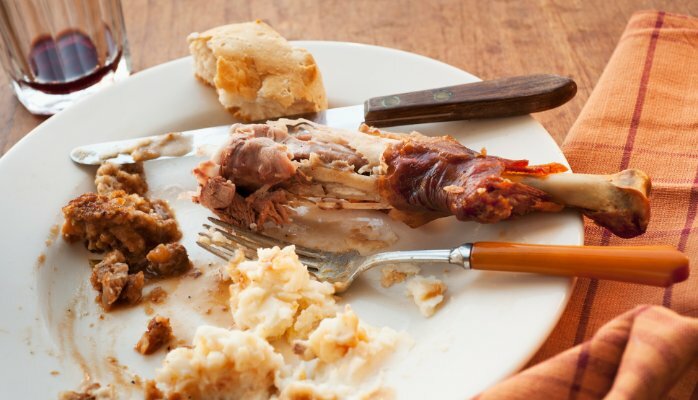 When you think of Thanksgiving, you probably imagine a huge, delicious meal enjoyed with friends and family. Many holidays and celebrations seem to revolve around food. After all, food is one of the basic necessities for human life. But in spite of its importance to our very survival, Americans throw away about 133 BILLION pounds of food – worth $162 billion – each year. For the average American family, that adds up to discarding about 20 pounds of food per person per month, which means we also are throwing away about $2,200 per household each year. 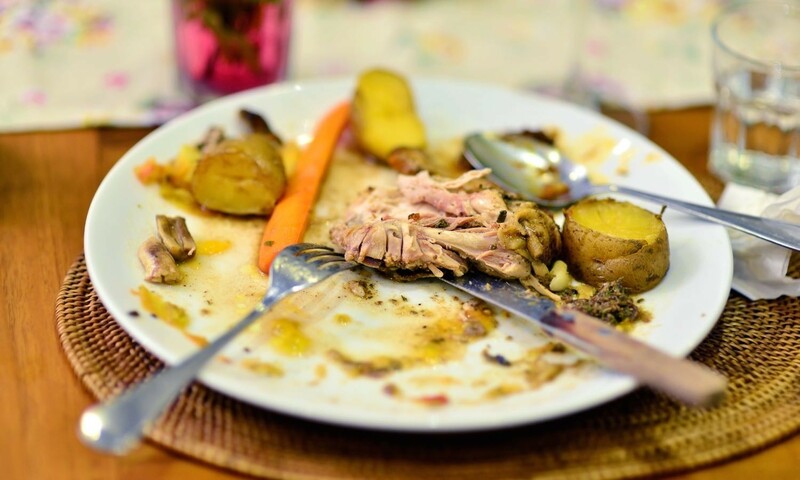 Whether you overbought at the grocery store, food wasn’t properly stored, or you have some picky eaters, unwanted food usually winds up in the trash where it is transported to a landfill. 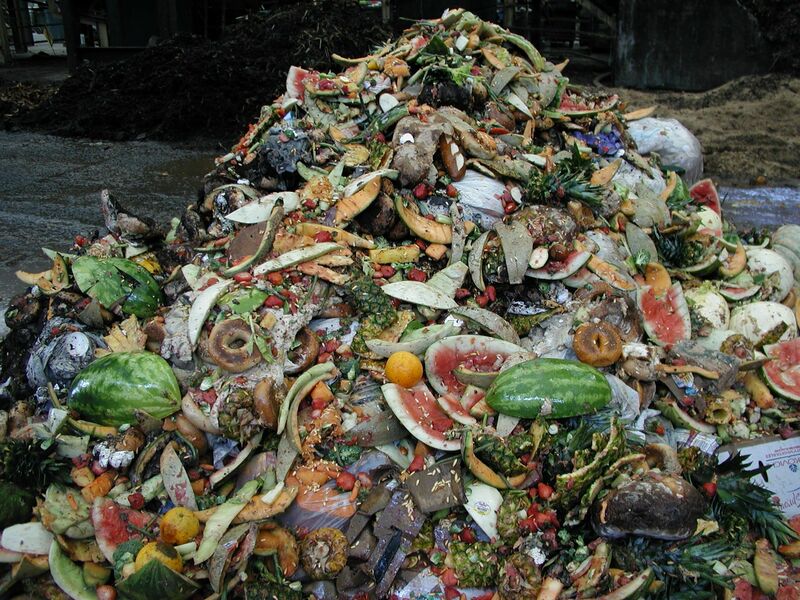 Food waste is the largest component of landfills, which in turn are the largest generators of methane, a greenhouse gas. On top of that, the land, water, energy, and other requirements of growing and transporting food to the consumer where about 1/3 of it winds up in the trash is a huge waste of resources. These steps involved in getting food to your table, which include fertilizer and pesticide use, irrigation, emissions from vehicles, and power generation, can degrade water quality. So what can be done to reduce the amount of food we throw away and the natural resources we waste or harm by doing so? A good starting point is to plan what food you want to serve for the week, buy only what you know that you will use, and properly store the food until it is consumed. Search for recipes that can incorporate often wasted items such as slightly wilted vegetables (try adding to soup) or overripe fruit (whip up a smoothie) to make meals your family will enjoy while using up all the food you purchased. When serving a meal, only put what you know will be eaten on the plate. You can always come back for seconds! Carefully and properly store leftovers. For food which has no further use (some fruit and vegetable cores and peels, coffee grounds, egg shells), starting a compost pile which will yield a rich organic soil amendment for your garden is a great option. Wasting good, edible food is especially disturbing since 1 in 6 Americans live in households where access to food is not always secure. Some places of worship, food banks and shelters can accept unopened, unexpired food – ALWAYS check with the agency first before you drop off any food. The mornings and nights are noticeably cooler, colorful crunchy leaves are falling from the trees, and the hours of daylight are getting shorter. Kids are back in school, the vacation mode of summer is a thing of the past, and the activity calendar is full. To balance out the uptick in your to do list, the growing season is winding down which means you don’t have to cut the lawn every weekend (just in time for football season)! 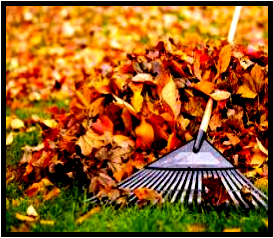 In spite of the change of pace in the yard which coincides with the start of cooler weather, there’s still a lot to do to take advantage of the gifts of autumn and get your landscape ready for spring. Sallie Lee, Urban Regional Extension Agent for the Alabama Cooperative Extension System, Jefferson County, has assembled some easy stormwater friendly tips to help you prepare your yard for the months to come. And as if that’s not enough, Sallie has provided some calorie burning motivation to tackle these tasks. Taking the time to implement these strategies now will have your landscape off to a great start when spring rolls round again. National Prescription Drug Take Back Day – October 22 – Safely dispose of old or unwanted prescription drugs at the Jefferson County Sheriff’s Office Center Point Substation (2651 Center Point Road 35215) or McCalla Substation (5725 Eastern Valley Road 35111) from 10am until 2pm. Visit the DEA website for more information. Cease the Grease – Remember that Jefferson County’s free household cooking oil and grease recycling program offers clean plastic jugs and recycling kiosks conveniently placed at 20 locations throughout Jefferson County. Birmingham Botanical Gardens Fall Plant Sale – October 22-23 – This is a great opportunity to purchase native plants and trees just in time for the optimum planting season! Visit bbgardens.org for more information. They’re Here!!! Stop by the Storm Water Management Department, Room B-210, Jefferson County Courthouse, to pick up your FREE 2017 Stormwater Calendar! They are called storm drains, inlets, culverts, and gutters. These openings, pipes, and ditches along roadways are built for the purpose of quickly removing rainwater from paved areas to prevent flooding. Unlike the sanitary sewer system which carries wastewater from homes and businesses to a wastewater treatment plant, storm drains carry rainwater and anything else on the ground directly to the nearest creek or stream. This water does not get treated. The thing is, storm drains are very conveniently located, and therein lies the problem. When working outside, it’s normal to want to be done as quickly as possible, and that includes cleaning up after completing a project. 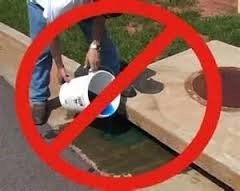 But it is not okay to use a storm drain for the disposal of grass clippings, car wash water, vehicle fluids, or any other material associated with your project due to its potential to pollute waterways. Take the extra step to properly dispose of waste or leftover materials. Grass clippings and other yard debris can be used to start a compost pile which will create some wonderfully rich nutrients to add to your garden. Cars should be washed on a grassy or other pervious area so that wash water can soak into the ground rather than run off into the street, or taken to a commercial car wash which captures and recycles wash water. Used vehicle fluids are accepted at most locations that service cars. The bottom line is that stormwater pollution affects everyone, and it takes everyone working together to keep Jefferson County waterways clean! Brown Bag Lunch and Learn Seminar Series – Birmingham Botanical Gardens, 11:30 am – 12:30 pm – This free seminar series continues through October. No reservations required; light refreshments provided. For more information, visit www.bbgardens.org. Easy care, low maintenance, and they bring added color and texture all year long! Discover the tried and true techniques of planting, propagating or moving established plants in your yard. Bring your garden related questions and ask the panel. Trees, turf, vegetables, soil, pests and disease – our experts have the answers! Discover what plants are harmful or toxic, how to control them and the folklore associated with them! Besides being high on many people’s list of creepy animals, most of us really don’t know too much about bats. These primarily nocturnal creatures usually live in trees, buildings, caves, and other sheltered places. While most of us sleep, bats perform some vital functions that directly benefit humans. Several varieties of bats feed on nectar, and serve as important pollinators for plants like bananas, mangoes and cocoa. (Think about that next time you have a piece of chocolate!) 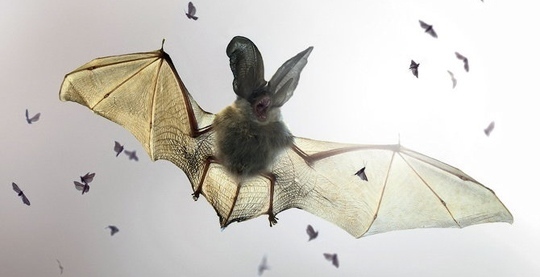 The majority of bats feed on insects and have such voracious appetites that just one small bat can eat more than 1000 mosquitoes in one night. Mosquitoes are not just pesky; they also can carry dangerous viruses. So it makes sense that attracting bats to come and live in your yard can provide a chemical free, low cost way to help make a dent in the number of mosquitoes that can plague you and your family. Purchasing or building a few bat houses and installing them on poles or on the side of your house that gets the most sun will provide an invitation for bats to come live and work in your yard. Since they are nocturnal, chances are good that you will never even see them! Another proactive measure to cut down on the mosquito population is to take steps to prevent mosquitoes from breeding on your property in the first place. Walk around your yard and remove any items which can hold standing water, such as buckets or empty containers. If there are elements in your landscape like low areas that can hold water but you cannot do anything to change them, consider using mosquito dunks on a monthly basis in these areas to kill mosquito larvae. While these efforts will not completely eliminate mosquitoes from your yard, they will help reduce the opportunities for mosquitoes to breed and feed.